8:30 p.m. We concluded our day of epic gorging with a lavish four-course Baja Med supper at Villa Saverios. At this point in the Baja culinary blitz, hunger was beside the point and we were game for just about anything. 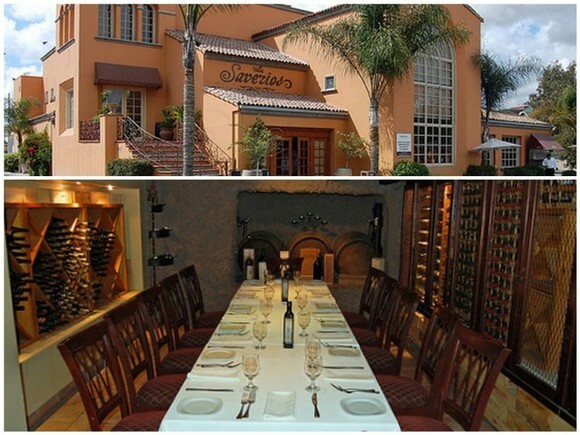 Villa Saverios is one of a handful of restaurants owned by Juan Plascencia, the founder of Baja’s first pizza parlor. Since its establishment in 1967, the Plascencia restaurant empire has grown to six eateries with locations throughout Baja and nearby San Diego. I love that in Tijuana every meal kicks off with a potent tamarind cocktail. This one consisted of a chilled blend of mezcal, Damiana, and tamarind. 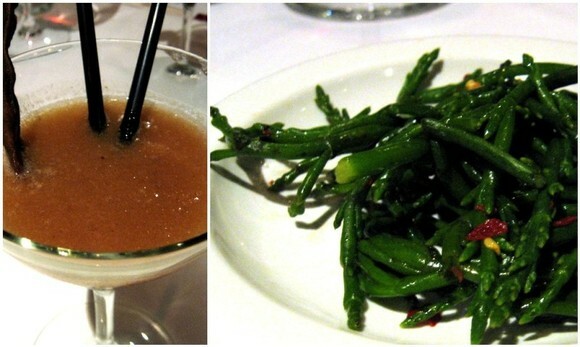 The tamarind pod garnish provided a puckery snack as I sipped the sour-tinged drink. Salicornia, also known as sea asparagus, were also on hand for us to nibble on. Thank goodness I was sitting next to Chef Ramiro of La Casita Mexicana or else I would have never been able to identify the salty branches on my bread plate. Our first course of the evening was a gorgeous octopus carpaccio with arugula, tomatoes, grapefruit, and locally produced olive oil. 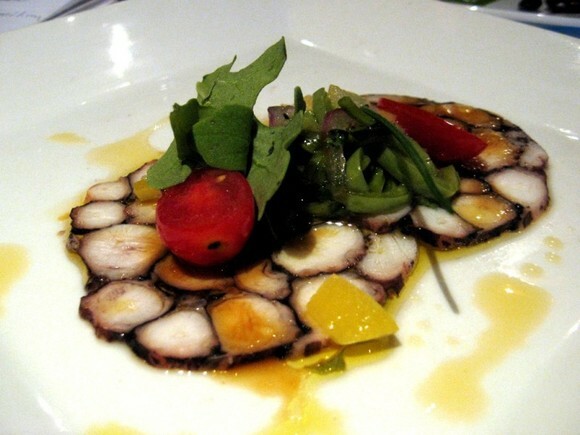 What surprised me about this dish was the manner in which the sections of octopus separated—piece by piece the circular rounds came apart and melted on my tongue. 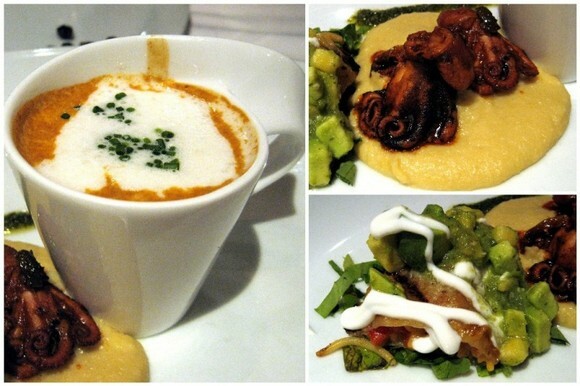 The dish’s flavors were clean, bright, and just what we craved after a day of intense eating. Course number two consisted of three small bites—black mussel “cappuccino” (left), char-grilled octopus on hummus (right, top), and spaghettini Romesco-style tacos (right, bottom). Served in the cutest of saucers, the cappuccino captured the deep flavor of mussels without a trace of the mollusk. The foam accent made the experience all the more cappuccino-like. The most intriguing item on the plate was the pasta taco. According to Chef Plascencia, this dish is an updated version of a snack he was served by his grandmother, who wrapped leftover fideo (pasta) in a tortilla. His interpretation included Christorra sausage, avocado, fresh panela cheese, cream, and salsa ranchera. Course number three had me begging my stomach to please make room for more. 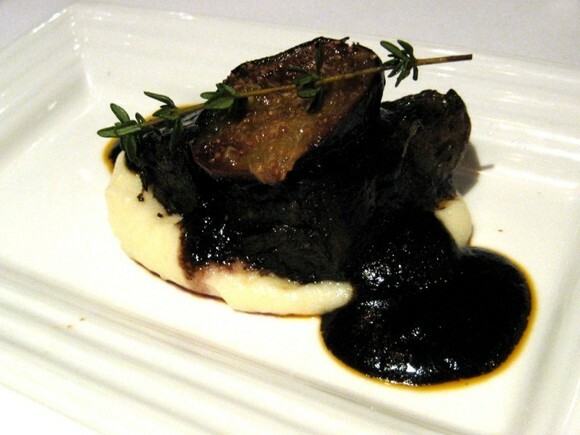 The costilla de res con mole de higo, short ribs in black Oaxacan mole flavored with Port wine and figs, put me over the edge with its well-rounded flavors and textures. Slow-cooked for six hours, the tender and caramelized meat rested on an impossibly creamy puree of potatoes mixed with mascarpone. A sprig of thyme and a grilled fresh fig completed the flawless dish. For the final course of the evening, we were treated to wild berry (blueberry and blackberry) tamales drizzled with sweet cream. I wrote in my notes that the tamales were “true to both elements, nothing gets compromised.” What I meant was that even though this was a dessert tamale, all the elements of a traditional tamale were present, including the strong taste of masa and the classic gelatinous texture. Even so, the flavors from the fresh berries were unmistakable. a blueberry tamale! i gotta have one of those. i didn’t eat that blackberry tamale because I was way too full. but i regret it now. I cannot believe how much you guys ate. 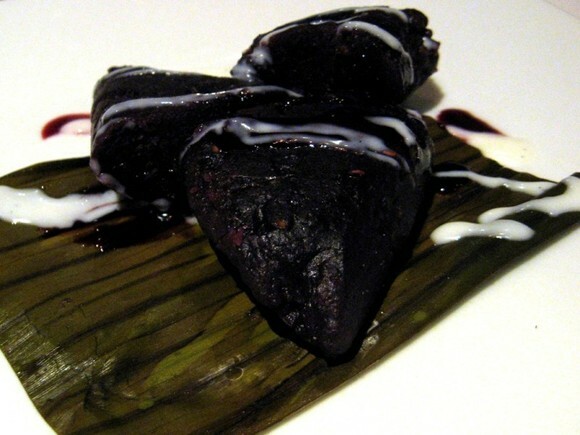 You going to try to recreate that blackberry tamale? Thanks for the Chef reviews. You know who to sit next too as well. Foxy chefs must mean you’re happy you’re still single. Continue on Chef blogger! woah… I’d love to try the wild berry tamales!!! they don’t happen to have it in LA?? I was setting at table 10 during the New Year’s Eve celebration. I asked the waiter for a Coke and waited for 30 minutes but it did not arrive. Then I went outside and asked the lady at the door to see the manager. She told me he is downstairs and she will immediately inform him. But nothing happened no Coke no manager and no customer service. There were two waiters serving about five tables. So I decided to ask the second waiter for the precious Coke and he brought it very quickly. So after one hour I received the Coke and the food was definitely for people who intended to lose wait. The Salmon piece was small. The salad consists of four leafs of lettuce and some cheese of top. Everybody at the table was starving. We paid $85 per person for the night but I think Saverios made $80 profit.